When it comes to finding a tasty burger, one of the last places some people might think to look would be a donut shop. 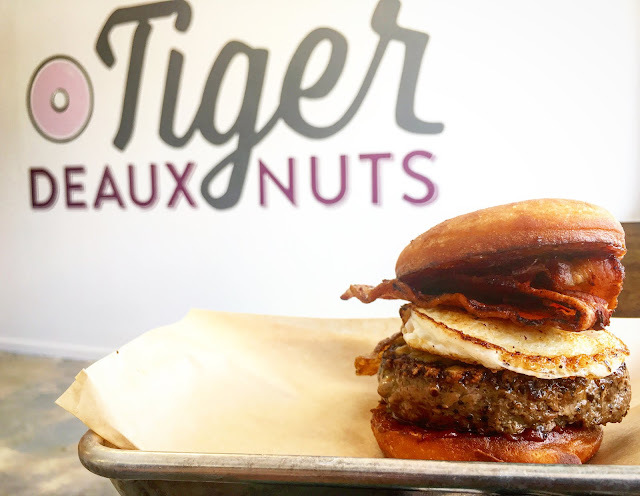 Unless, of course, you happen to stop by the newly renovated Tiger Deauxnuts and check out their revised menu which now features lunch options, including one very delicious Brunch Burger. When I noticed there was a burger on their new lunch menu, my obvious first thought was “This thing better have donuts for buns.” I mean, how could it not? This is a donut shop and it would only make sense! Thankfully, I was not disappointed. Sandwiched between two donut buns was a perfectly cooked patty that was seasoned to perfection. There was a nice crust on the top and bottom of the incredibly juicy patty. And of course, what’s a Brunch Burger without a fried egg. The egg was cooked just right with very little greasiness. The bacon was crispy without being overcooked and dry and the tomato marmalade was a nice touch to finish it off. My only suggestion would be to maybe drizzle a bit of glaze over the donut buns to give it that sweet and savory taste. Owner Jeff Herman has been making some of my favorite donuts ever since he was operating out of a very small shop right off of Coursey Blvd years ago and I’m happy that he has continued to grow and be successful with his newly renovated location on Government Street. The next time you’re craving a burger and want to try something new, give the Brunch Burger at Tiger Deauxnuts a try.